We're glad that Colorado Republican candidate Cory Gardner didn't co-sign to this nonsense. (AP) - A Republican congressman suggested that President Barack Obama favors blacks over whites, prompting a GOP candidate to cancel a fundraiser headlined by the Iowa lawmaker. 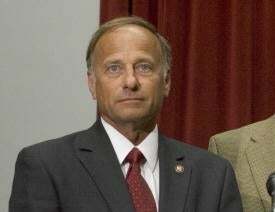 Rep. Steve King, known for sometimes incendiary remarks about immigration, Abu Ghraib and other issues, criticized Obama and Attorney General Eric Holder, who also is black, in an interview Monday on G. Gordon Liddy's nationally syndicated radio talk show. "I'm offended by Eric Holder and the president also, their posture," King said. "It looks like Eric Holder said that white people in America are cowards when it comes to race." King continued: "The president has demonstrated that he has a default mechanism in him that breaks down the side of race on the side that favors the black person in the case of Professor Gates and officer Crowley." He was alluding to last year's incident in which Obama commented on a white police officer's arrest of a black professor from Harvard University. Said professor is our editor-in-chief, Dr. Henry Louis Gates Jr.